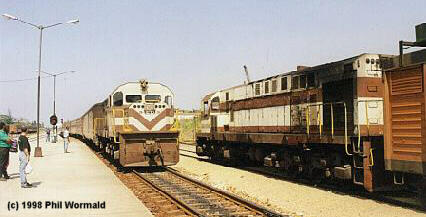 A mighty fleet of fifty MLW MX-624 were bought in 1975/76 (bns M6090.01 - 30 and M6094.01 - 20). Theit 12-251F engine develops 2400 HP diverted to six axles. According to Phil Wormald, these units are quite loud, similar to our favorite dieseldom Greece. The MLWs are used for heavy passenger and freight haulage as seen below. 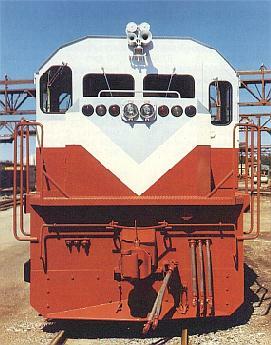 Factory shot of a MLW MX-624 for Cuba, note the different colour scheme. 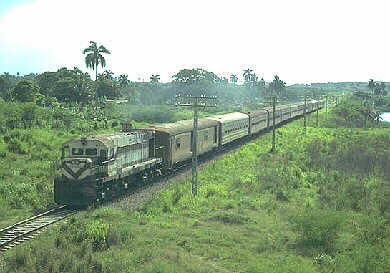 A meet between 52405 (arrives 12 hours late) and a class mate in Matanzas, May 1998. Express No. 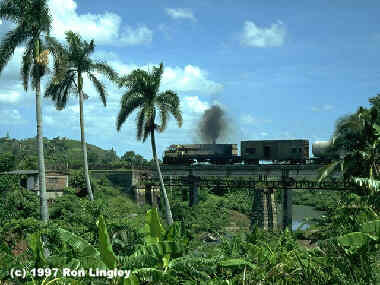 1 underway from Havana to Santiago de Cuba near the capital. 52408 leads on May 23rd 1997.